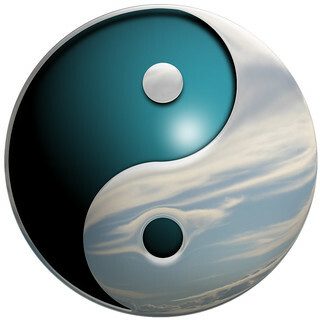 Yin Yang is a Chinese symbol illustrating "how polar or seemingly contrary forces are interconnected and interdependent in the natural world, and how they give rise to each other in turn." This simple shape of mirrored inverted images is represents many concepts and a variety of religious, and cultural practices including Taoism, the I Ching, Tai Chi and more. Continue reading on Wikipedia. Yin, Yang, slow, fast, soft, hard, yielding, solid, diffuse, focused, cold, hot, wet, dry, passive, aggressive, water, fire, earth, sky, moon, sun, femininity, masculinity, nighttime, daytime.